This is the first in a series of blogs based on my recent visits to Singapore and Australia. 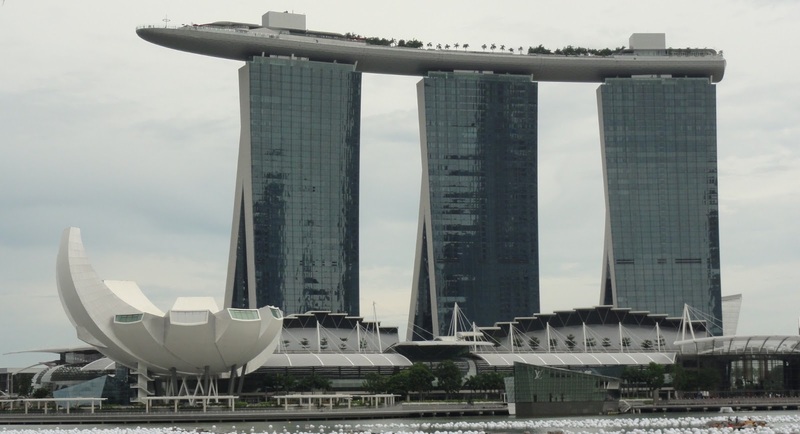 Singapore is a large metropolitan city, with 5 million people on it's small island (only 272 sq miles). 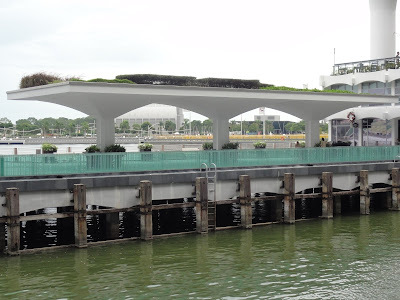 The thing that strongly hit me as soon as I arrived at the airport, was how green Singapore is. Green as in plants everywhere. I was too busy admiring the airport, and tired from the 13 hour flight from UK to actually think of taking photos upon arrival, so here is one I got from Wikipedia of a passenger area in Terminal 2. I've never seen an airport so lush with planting. Actually, you don't get much planting in airports generally. 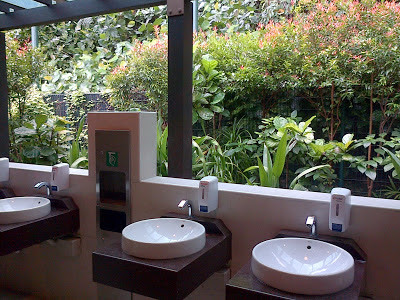 I can tell you there are 5 gardens throughout the 3 terminals at Singapore Changi airport. This includes a cactus garden, orchid garden and koi pond and a butterfly garden. This is at the airport! I sadly didn't get to visit these as I planned on my way back to the UK, due to illness, but I found this great link with lots of photos to give you an idea. The greenery continues throughout the island of Singapore. There must be a lot of soil to give it this roof such height with the planting, so the building must be structurally incredibly strong. 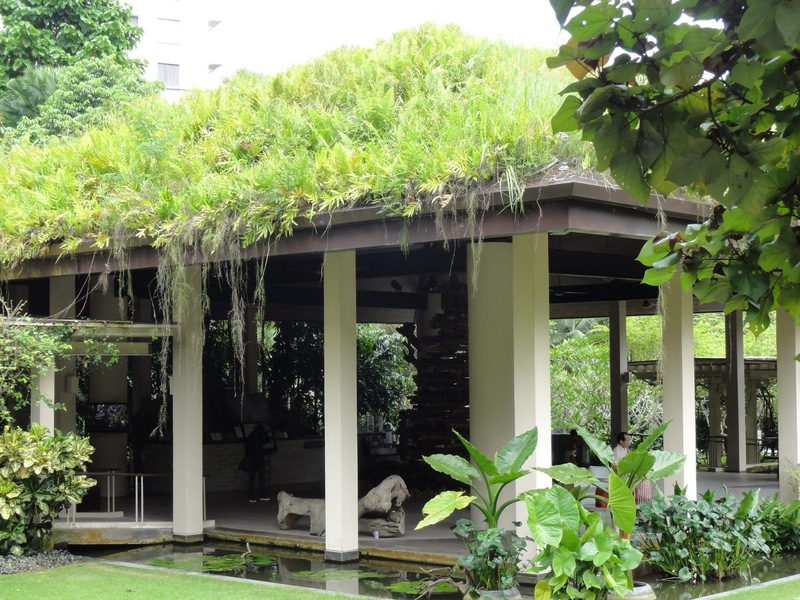 This green roof was on a walkway, keeping the area underneath cool and a space for visitors to get out of the hot sun. For all that weight, walking under it, it felt very light and airy. 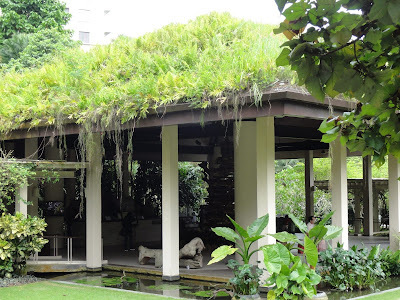 Green roofs can be found in buildings all over Singapore. Here is one down at the marina. Once again it is a walk way where they have put planting at the top an around it. 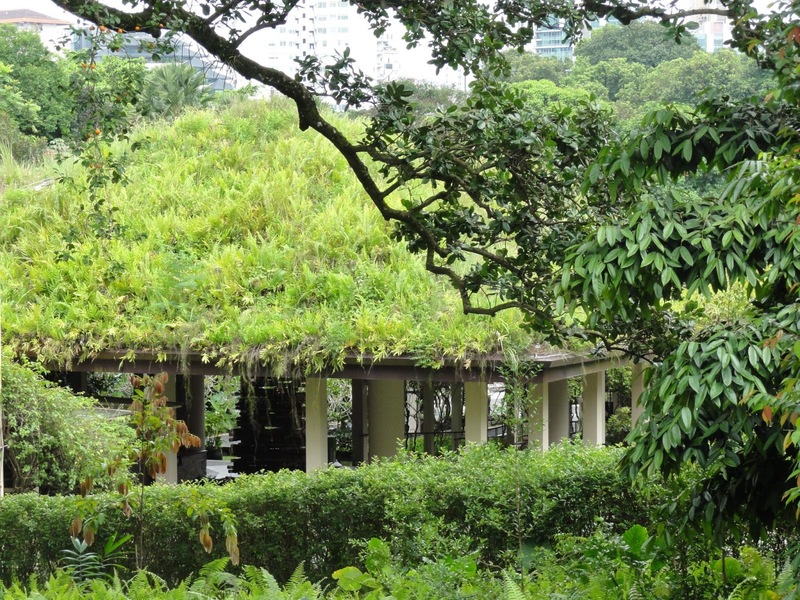 The most amazing green roof I saw was this one. This is on top of Marina Bay Sands hotel. On the top is a restaurant, complete with palm trees and a swimming pool. Of course the hotel is only for the very rich (not the likes of me! ), but that doesn't take away the impressiveness of planting a garden on the top of a very tall building. The building to the bottom left, which I thought looked like something out of 2001: A Space Odyssey, is meant to be reminiscent of the shape of a lotus flower and contains the ArtScience Museum. I remain to be convinced of that it resembles a lotus flower, but I like that even the architecture is meant to resemble plants. For the more every day planting, and I think this is the part I liked about Singapore's greenery the most, was the fact that even the roads and freeway systems are completed planted around. In this snapshot below, you can see that there is even planting growing up the arches holding the freeway up. 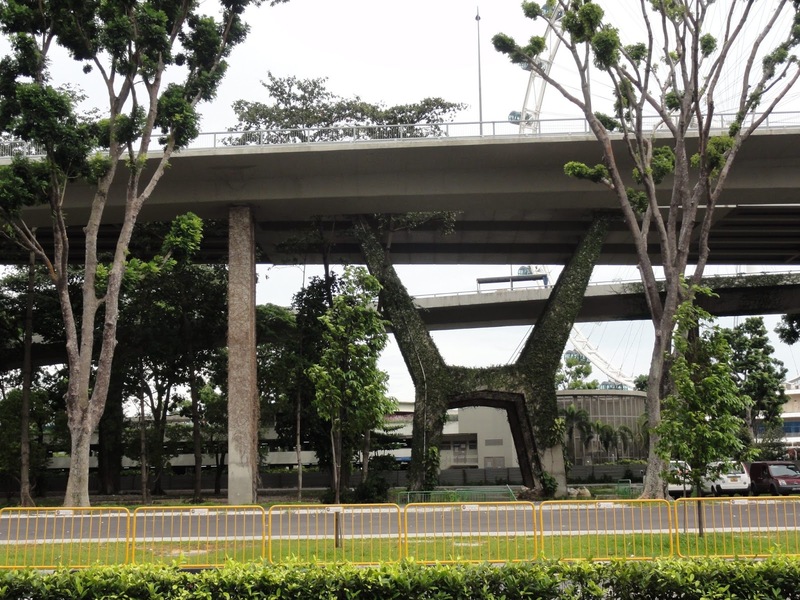 And there are trees planted on the top of the freeway. The amount of detail that goes into all the planting is wonderful. In some areas (which I forgot to photograph as I was just ooohh-ing and ahhh-ing instead), the planting has grown to the point that you can barely tell that it's a freeway all all. The following photos is the view from my friend, Su-Ann's, place. This is a fairly normal view for everyone all over Singapore. There might be 5 million people on a small island, but you wouldn't know it with this much planting. 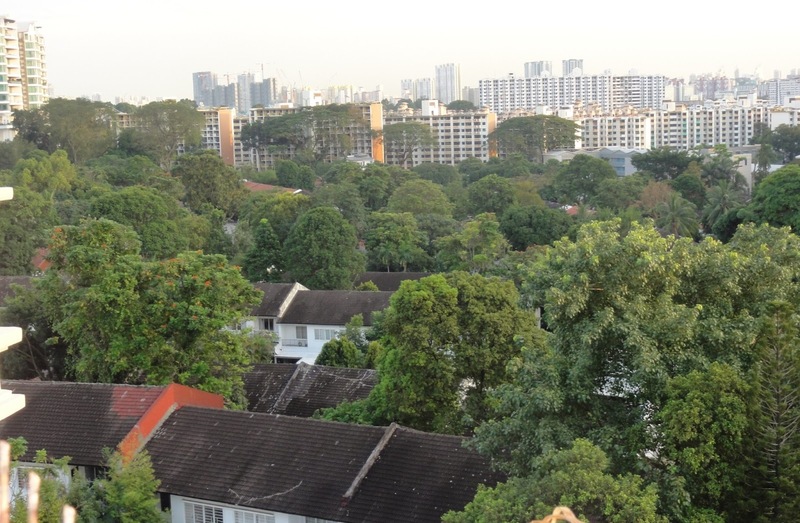 Yes, there are high rises, but within each high rise there are green spaces, that are well-used by everyone. Finally, back at the Singapore Botanic Gardens. This is the women's toilets. 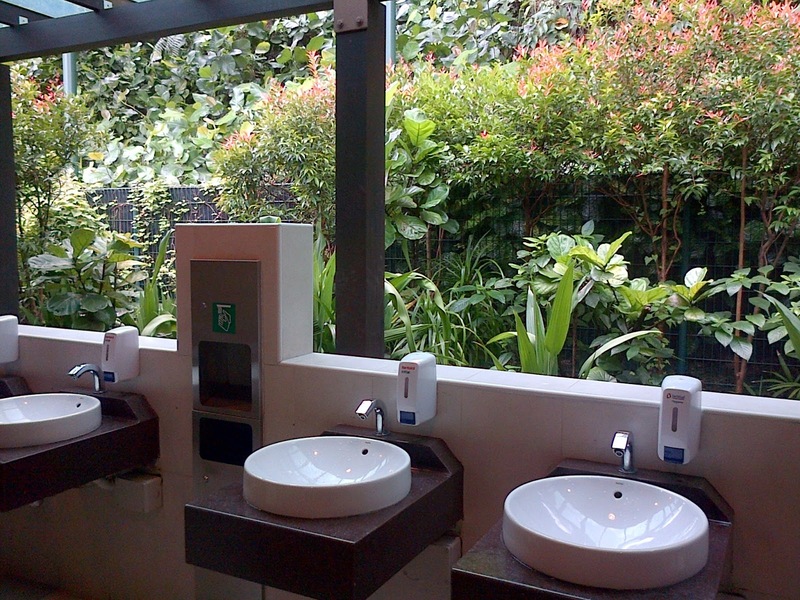 Yes, even toilets are architecturally attractive and involve plants. As you wash your hands you have a live 'picture frame' of planting to enjoy. I wish I had more photos to show you, but I was ill on my 2nd stay in Singapore on the way back to the UK, so I didn't get to visit the Gardens by the Bay and other lush places. 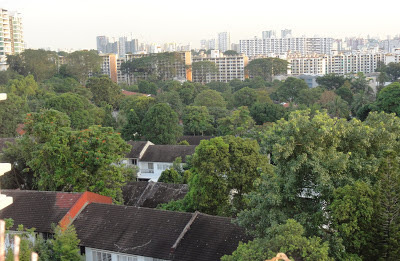 But hopefully this gives you some idea of just how green Singapore is. For me, it showed that big modern cities, from their airports to their freeways and toilets, can be beautiful green spaces too.